1.) the destruction of all Monarchies, especially in Europe because European Monarchs were Catholic. It started with France, and ended in November ARSH 1918 with the abdication of Charles I of Austria, now known as Blessed Karl and German Emperor Wilhelm II. Fascinatingly, Emperor Charles I did NOT abdicate. He… wait for it… “RENOUNCED PARTICIPATION IN STATE AFFAIRS.” That has an oddly familiar ring to it, no? Emperor Wilhelm II of Germany warned the Archbishop of Cologne, Cardinal Felix von Hartmann, of the Freemasonic warplan, and Hartmann wrote a letter on November 8, ARSH 1918 to the Apostolic Nuncio (Vatican Ambassador) to Germany who was, at the time, Archbishop Eugenio Pacelli – who was to become Pope Pius XII in March of ARSH 1939. Emperor Wilhelm II of Germany abdicated the next day, 9 November ARSH 1918, and Emperor Charles I of Austria “renounced participation in state affairs” two days after that, on 11 November. Charles I DID NOT ABDICATE. 2.) the attempted destruction of the Papacy is the next necessary Freemasonic step in destroying the institutional Church and establishing a one world government and humanist religion. Remember the piece posted just below this one in which the “demythologizing” of the Papacy is exposed as a buzzword in the Modernist agenda driven toward dissolving the Petrine Office – which is an Absolute Monarchy directly established by Christ Almighty – and replacing it with a counterfeit “collegial, synodal Petrine Ministry”? Das Thema Papsttum gehört nicht zu den populären Themen der Nachkonzilzeit. Es hatte ein gewisses Maß an Selbstverständlichkeit, solange ihm in politischen Raum die Monarchie entsprach. In dem Augenblick, in dem der monarchische Gedanke praktisch erloschen und durch die demokratische Idee abgelöst ist, fehlt der Primatslehre das Bezugsfeld in unseren allgemeinen Denkvoraussetzungen. So ist es gewiß kein Zufall, daß das Erste Vatikanum von der Primatsidee, das Zweite aber von dem Ringen um den Begriff der Kollegialität beherrscht wurde. Ratzinger then continued on in the piece to implicitly accept the notion of the “expiry” of the monarchic model of the Papacy. If you read Miller’s dissertation, you will clearly see that Ratzinger, even as the MOST CONSERVATIVE voice in the bunch, has still fallen for this lie, planted in the German academic zeitgeist by Freemasons decades before, and really dating back to the Lutheran Revolt itself. For those of you who have spent the $9 and bought the online version of J. Michael Miller’s doctoral dissertation and read even the tiniest section of it, four words in that pullquote from Pope Leo XIII will have jumped off the page at you. Those four words: FOUNDED BY DIVINE RIGHT. These terms are then applied to the concepts of REVERSIBILITY and MUTABILITY, namely, can the Papacy be reversed – that is, TOTALLY ABOLISHED (Kung and Neumann said “yes”, most others, “no”) and can the Papacy be CHANGED, even radically (nearly all cited said “yes”, and not only “yes”, but “yes, and it MUST be changed”). IF I WERE A BETTIN’ GIRL, I WOULD LAY MONEY THAT THIS “VERY INFLUENTIAL MAN IN ROME” WAS THE HEAD OF THE ROME MASONIC LODGE (GRAND ORIENT) AT THE TIME, GUSTAVO RAFFI, OR HIS SUCCESSOR, STEFANO BISI. But NAH, there’s nothing to see here, folks. There is absolutely no evidence of anything whatsoever so shut up stupid insane schismatic stupid crazy stupid crazy stupid schismatic! Like St. Vincent Ferrer, I think that in these days we should especially enjoin as intercessors Blessed Karl (Charles I of Austria) and his wife Zita, who is now a Servant of God. 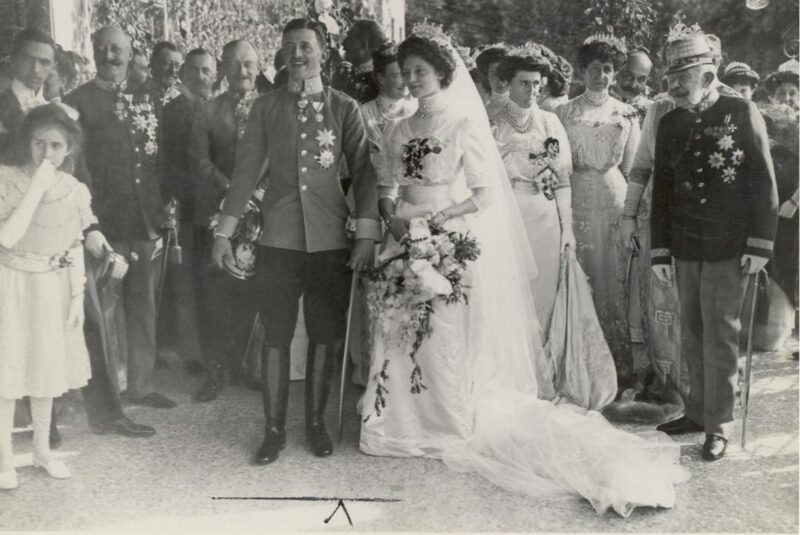 They lived being forced out of their rightful monarchical state by the Freemasons, but Blessed Charles, with Zita at his side, stood firm and refused to abdicate. How can they but be powerful advocates and intercessors in these dark days now that the Freemasonic plot that forced them from their rightful throne has now reached its ultimate target of the Petrine See itself? Personally, I could kick myself for not making this connection sooner. Here is a lovely picture of their wedding day. By all accounts they were truly beautiful people, both inside and out. Blessed Karl and Servant of God Zita, pray for us! This entry was posted in Uncategorized on January 18, ARSH 2019 by Ann Barnhardt.